“Thus have I heard. At one time the Buddha was staying on Vulture Peak in Rājagṛha with a large company of twelve thousand monks. They were all great sages who had already attained supernatural powers. Their names included the following: Venerable Ājnāta kauṇḍinya, Venerable Aśvajit, Venerable Vāṣpa, Venerable Mahānāma, Venerable Bhadrajit, Ven erable Vimala, Venerable Yaśodeva, Venerable Subāhu, Venerable Pūrṇaka, Venerable Gavāṃpati, Venerable Uruvilvākāśyapa, Venerable Gayākāśyapa, Venerable Nadīkāśyapa, Venerable Mahākāśyapa, Venerable Śāriputra, Venerable Mahāmaudgalyāyana, Venerable Kapphiṇa, Venerable Mahākauṣṭhila, Venerable Mahākātyāyana, Venerable Mahācunda, Venerable Pūrṇa maitrāyaṇīputra, Venerable Aniruddha, Venerable Revata, Venerable Kimpila, Venerable Amogharāja, Venerable Pārāyaṇika, Venerable Vakkula, Venerable Nanda, Venerable Svāgata, Venerable Rāhula, and Venerable Ānanda. All of these were elders. As I said, “thus have I heard” indicates the authenticity of the teaching as the direct instruction of Shakyamuni Buddha, which should be accepted as it is. Unfortunately, there are some people nowadays who deny the authenticity of the Mahayana sutras in general, and of the three Pure Land sutras, in particular, saying that because they appeared later in written form, they are in fact, the creation of some monks. Many Theravadins share the same opinion on this matter and claim that their Pali canon is the only authentic set of sutras. However, common sense dictates that the time when a Buddhist sutra was put into written form was not automatically the time of its creation. 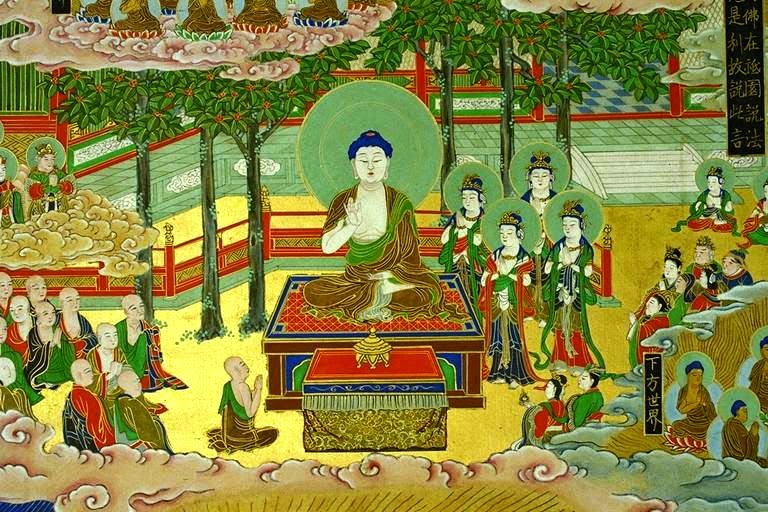 During Shakyamuni Buddha’s life and later, upon His physical death, His discourses (sutras) were transmitted orally and sometimes by His closest disciples through special states of mind called Samadhi for hundreds of years before they were put into written form. The Pali Canon was, in fact, preserved in the artificial language of Pali (which neither the Buddha nor anyone else ever spoke) while the Mahayana sutras were initially preserved in Sanskrit (a language which Shakyamuni, a highly educated person, may have spoken). Some make the claim that the Pali Canon of the Theravada school is the oldest and thus the most reliable collection of sutras. Positing that all the discourses or sutras originated from Shakyamuni, then the fact that some were put into written form earlier than the others is not proof of their exclusive authenticity or superior content. The Mahayana and Pure Land sutras did exist and were transmitted in the same timeframe with the sutras of the Pali Canon. Also, we have seen in the first passages of the Larger Sutra quoted above, that among the assembly gathered on the Vulture Peak where Shakyamuni delivered it, there were “twelve thousand monks […] all great sages who had already attained supernatural powers.” This aspect is extremely important because it is an indication about who were the monks who heard this sutra and later transmitted it to further generations. They were monks who had “attained supernatural powers,” and it follows that these monks used their mind power to accurately transmit this sutra by Samadhi to others. Among these monks we read the names of Venerable Mahakasyapa, Venerable Sariputra, Venerable Mahamaudgalyayana, etc. More than this, they were not the only listeners. Great transcendental Bodhisattvas like Samantabhadra, Manjusri and Maitreya, the future Buddha, were present too, and they all rejoiced at hearing the Amida Dharma, which can only mean they had faith in it and later helped in its promotion. Now let’s move to the 2nd fragment of the Larger Sutra which describes the qualities of the Bodhisattvas in audience. 1. Bodhisattvas in aspiration who have made the vows of becoming Buddhas for themselves and all beings, but who are still on the path (still in training) and still unenlightened (not Buddhas yet). Anyone who made the four Bodhisattva vows may call himself or herself a bodhisattva in aspiration. Some bodhisattvas may be very much advanced and on various higher levels, even extremely close to Enlightenment, but as long as they have not reached perfect Enlightement I also include them in this category. 2. Bodhisattvas who already attained Buddhahood or perfect Enlightenment but who do not remain secluded in their Enlightenment. These are in fact, ancient Buddhas who manifest as Bodhisattvas. In this category we find Avalokitesvara, Mahasthamaprapta, Samantabhadra, Manjusri, Maitreya, and many others. Bodhisattva Wisdom of Vows, Bodhisattva Sweet-smelling Elephant, Bodhisattva Hero of Treasures, Bodhisattva Dwelling in the Center, Bodhisattva Practice of Restraint, and Bodhisattva Emancipation. As we clearly see in the above quote taken from the first and second sections of the Larger Sutra, the three Bodhisattvas, Samantabhadra, Manjusri and Maitreya, the other sixteen lay Bodhisattvas and in fact,” all the Bodhisattvas in the assembly”, already attained Enlightenment - "had reached the shore of Emancipation". And at the end of his physical body, he "demonstrates that he passes into Nirvana", or in other words, he puts on the show of disappearing into the non-comprehensible state of beyond form and non-form, but in reality, according to the Larger Sutra, he "endlessly brings sentient beings to emancipation", which means that his activities in various manifestations continue in other places of the universe, where he starts again the same story. Simply stated, let’s imagine that you, the reader of these lines, are a Buddha and I, Josho, am a stupid unenlightened person, which I am, of course :) You attained Enlightenment many kalpas ago, in the distant past, but because you have Compassion for Josho and other beings of this earth, you decided to manifest yourself here. If Josho is attached to his own personal power, then you need to show Josho that a person like himself can become a Buddha and in order to encourage him to start practicing you take the appearance of a person who is unenlightened and who passes through the same difficulties like him. So, you play this game for Josho because his mind cannot be convinced in another way. After “many struggles” you attain Enlightenment and thus prove to Josho that it’s possible for him too, to become enlightened. Josho is thus encouraged to start practicing, thinking that if you, his friend or teacher, struggled and attained it, then he can do this, too. Also, if Josho or others become deeply aware of their own limitations and incapacity to become a Buddha like you, in the present life, and because indeed most of the people from your time and especially after you leave your physical body, will be incapable to attain Enlightenment in their present life, you start teaching to them Amida’s method of salvation. Because you are a Buddha, your listeners will trust your various teachings and follow them. But what they and Josho do not know is that you were Enlightened from the very beginning of your life in their realm and that all your years spent among them were just a useful mean for them and others to entrust to you and to your teaching. So, these are the Mahayana Bodhisattvas who gathered to listen to the Larger Sutra together with “twelve thousand monks, all great sages who had already attained supernatural powers”. Certainly, such great beings who witnessed the teaching presented that day on the Vulture Peak have always been promoting and protecting its transmission to later generations. Followers of Theravada school which rely on the sutra canon in Pali. All those who become great Buddhas spend their prior life in the Tusita Heaven. When you read verses about great Bodhisattvas who postpone their own attainment of Enlightenment until all beings enter Nirvana, those refer to the profound truth that their Enlightenment has no trace of ego, and that the Nirvana they attained is not a personal Nirvana (they did not attain it for themselves), but a continuous awareness of the suffering of others and a constant effort to save them. How else can it be, when a Buddha has Infinite Wisdom and Infinite Compassion? It is something natural for a Buddha to immediately return to Samsara, in many forms, to help all unenlightened beings, while retaining His Nirvanic state of mind. The aspiration of the Bodhisattva Path is to become a Buddha for all beings, so once a Bodhisattva actually becomes a Buddha, He will continue to manifest in Samsara, taking up various forms, from the highest to the lowest, and going to all the worlds and universes to turn the wheel of Dharma. Thus, He plays again and again the skilful game of a beginner who leaves family, starts practicing, and finally attains Enlightenment, doing all these in order to encourage beings in various worlds to practice the Dharma themselves. We who entrust to Amida Buddha will also become such active Buddhas who manifest as Bodhisattvas after we are born in His Pure Land, after death. This is what Amida promised in His 22nd Vow, and this is the meaning of the term "bodhisattva" from that vow. Hymns of the Pure Land - The Collected Works of Shinran, Shin Buddhism Translation Series, Jodo Shinshu Hongwanji-ha, Kyoto, 1997, p.349 In Shinran’s day, Gaya – the place where Shakyamuni attained Enlightenment – was sometimes confused with Kapilavastu, his birthplace (note of the translator).